Sometimes I think my fun-O-meter is broken. Lots of things I’m supposed to think are fun make me anxious, and things that other people dread as chores (making dinner!) are what I live for. For me, tonight was a fun night! Hooooo boy. First of all, we made vegan veggie burgers that were grillable! They got brown on the grill, they didn’t fall apart!! We made them from scratch! We grilled flatbreads, which we made from scratch as well! I’ll tell you about them eventually, with recipes and everything, but for now let me say that I felt so happy about it, and had so much fun doing it that it was just ridiculous. Then we went for an after dinner walk on the towpath (love it!) and we played tag. But not the kind of tag where you have to run all the time, because that wasn’t an option (sooooo full of grilled veggie burgers). The kind of tag where you could hold hands with someone, or give them a hug, giggling maniacally the whole time, and that would pass along the “it”ness. Good times!! …dessert one of those fabulous french tarts (er tartes) – tart dough, then a pate of crushed or somehow pated pastichios – may have had another ingredient in pate, i don’t know. maybe a bit of a liquer or rose water or something. (it was from a pastry shop so i couldn’t ask). and on top apricots. in a sense it was like a tarte with pistachio pate instead of custard under the fruit, but the apricot was not raw – it was baked. Well! With my obsession with frangipane, and making frangipane out of hazelnuts or other non-almond nuts(which makes it no longer frangipane!) OF COURSE I had to try this!! I made a simple paté sucrée crust, with a hint of cardamom. I made a pistachio frangipane (an imaginary beast! ), and then I just sliced very ripe apricots, and sprinkled them with sugar because they’re quite tart! I liked the resulting tart very much indeed, but I have to admit that my boys wouldn’t try it because they don’t like apricots. And the apricots were tart. It was a tart tart. This appealed to me very much! I think it would be nice with some lightly whipped, lightly sweetened whipped cream. 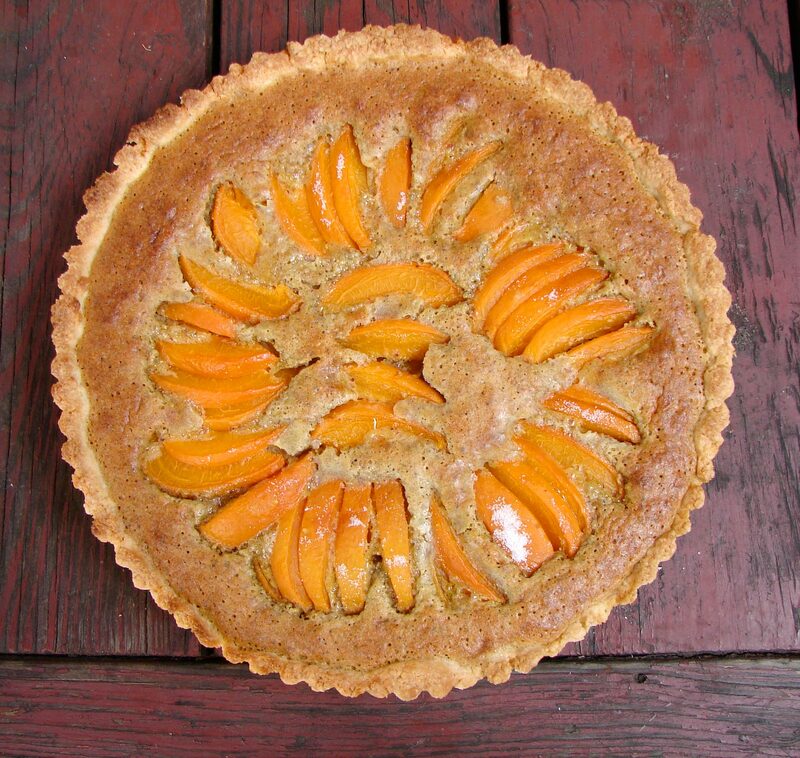 The tart won’t last for days in pristine form, because the fruit softens the crust. So eat up!! Here’s Noah and the Whale with Five Years Time. They’ll have FUN FUN FUN!! This does actually look like fun to me, but it’s also a critical reexamination of past ideas of funness. Mix the flour, salt and cardamom. Cut in the butter. Work it in with your fingers till you have a crumby consistency. Stir in the egg. Knead for a few minutes to the butter and egg are well integrated. Wrap and chill, baby, chill. Cream the butter and sugar together. Add the vanilla and eggs and beat till nice and frothy. Grind the pistachios with the flour. Add the salt. Mix these with the eggs and butter. Beat very well, till everything is combined and seems quite smooth. Roll/press the dough into a buttered/floured tart pan. You probably won’t be able to roll it out the whole way, because it’s so soft and buttery. (I couldn’t!) So you’ll roll it into a flat, thick disc, and then put it in your tart pan and use your palm and fingers to press it out and build a nice crust up the sides of the tart pan. Bake this for about five minutes – just till it stops being shiny. Spread the pistachio mixture in the baked tart crust. Don’t peel the apricots, but cut them in half lengthwise and remove the pits. Then place them cut side down, and slice them into 1/4 ish inch slices, in an arc. Transfer them, holding the slices together, and set them on the pistachio cream. Fan them out into a pretty pattern. Repeat with each apricot. Sprinkle 2 T of sugar on the apricot slices. Bake for about 20 minutes, till the pistachio cream is puffed and brown. Let this cool before you try to cut it. 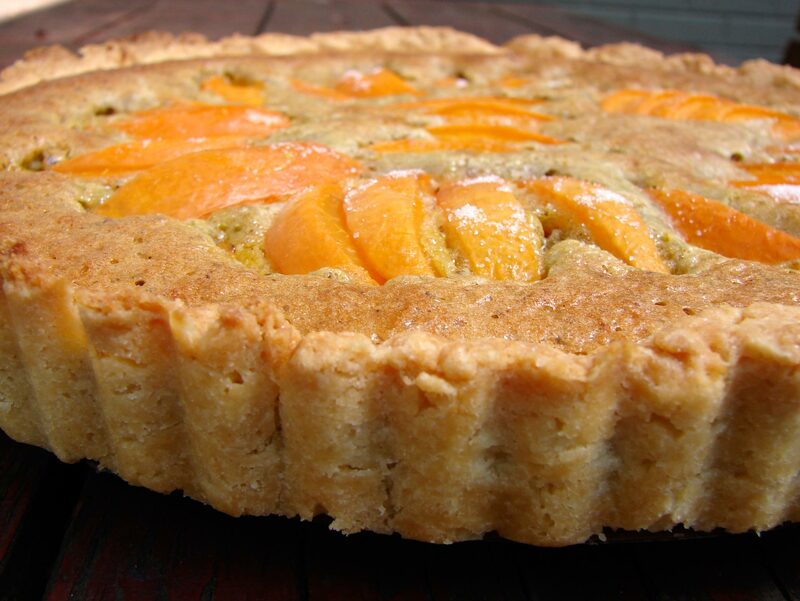 This entry was posted in basic pie filling, crust, dessert, recipe, Uncategorized and tagged apricot, cardamom, pistachio, pistachio frangipane by Claire. Bookmark the permalink. moss in the lawn and then the lawn will really look good in its newly fed soft soil and the green grass that are going to cover the soil of your lawn to bring in the velvety feel underneath your feet. simply hire someone to do it for you. Download FIFA 19 Mod Apk As Well As Obb Information For Android. Serial Number Adobe Photoshop CS6 – Photoshop adalah aplikasi editor image terbaik saat ini dan sekarang sudah upgrade terbarunya yaitu CS6 yang telah banyak sekali beredar didunia internet dengan web link download full version gratis, Nah disini saya akan berbagi untuk sobat identification number untuk digunakan mengaktivasinya agar photoshop cs6 anda menjadi complete version tanpa trial lagi. Was wishing this listing will offer some concepts regarding what I might play after the Witcher that has outstanding tale, however the moment I saw Skyrim( taken pleasure in the game btw, yet it’s just miles far from the story-telling in Witcher 3) there – I understood it wouldn’t take place.\n\nMuch like other MOBAs the game is best when having fun with friends, and since it is a 3v3 experience you only require 2 other players for a group, which every true MOBA follower will certainly know is a very attractive proposition.\n\nAttributes consist of in-game voice conversation to make interaction between you and also your allies much easier, an AI system to change gamers that get or leave disconnected, individual audio sets for heroes to develop an one-of-a-kind video gaming experience, a far better and also boosted match-making system to make certain all video games are an obstacle, a viewer system to allow players to conveniently view other video games as well as a rewards system based on area involvement and mentorship. \n\nThe Android-based MOD Live ships with 4 brand-new, industry initially applications: Buddy Monitoring, Smart Device Connection, a Navigating app pre-loaded with the biggest data source of route maps in the world, Songs Playlist Setting, and also Video camera Connection for use in the future with select cordless point-of-view action electronic cameras.\n\nFIFA 19 is perhaps the very best soccer video game currently ahead of the Pro Evolution Football 2019 FIFA 19 was initially launched on Console, Xbox as well as PS4, and also now the video game is available for you to play on your Android and iphone devices.\n\nA few of the featured leading football super star gamers in PES 19 Apk Mod includes Messi, Ronaldo, Mo Salah, Harry Kane, Lewandowski, Eden Risk, Kylian Mbappé, Pogba, Lukaku, Morata, Higuan, Dembele, Sanchez, Suarez, Mane, Williams, Sagio Ramos, John Stones, Ngolo Kanté, Sane, Aguero etc\n\nSo here we proceed as well as select various goals as you continue unlocking you will be up advancing with that said so there’s gon na be a great deal a lot a whole lot an airplane here there’s a lot of playing their plants go back once again one point to remember ensure you go to your account ensure you check in with the WB account on that particular method we have this video game in the console you will like a couple things in the council cultural reach level 20 prior to you eliminate like the death at thinkers he death when you reach degree 20 support card will certainly be right here.\n\nAndroid fans: you no longer need to view on the sidelines as your good friends play TELEVISION tennis with their iPhones Rolocule has launched Movement Tennis Cast, an Android version of its free sporting activities game that uses screen mirroring tech (such as Chromecast, Miracast or Samsung’s AllShare Cast) to transform your phone right into a Wii Sports -like motion controller, with your TELEVISION or a Chrome browser tab functioning as the display.